The Food Alphabet and More: Starbucks survey: Are you Team Hazelnut or Team Caramel, Vote for your team! 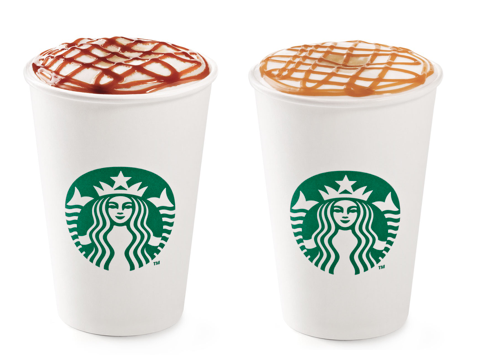 Starbucks survey: Are you Team Hazelnut or Team Caramel, Vote for your team! Team Caramel or Team Hazelnut? The winning Macchiato beverage will be announced on March 6, 2015 via Starbucks Philippines Facebook Page and thru the Daily Offerings Board in Starbucks stores. The winning Macchiato beverage will be celebrated with a special Macchiato Buy One, Get One event, Macchiato Monday, on March 9, 2015 in all Starbucks stores nationwide. Team Caramel won it last year, will Team Hazelnut make a comeback to win this year's favorite Macchiato flavor? Or will Team Caramel continue to dominate? Vote for your favorite today! The Macchiato Buy One, Get One event is valid only for the winning Macchiato beverage (hot and iced, of any size). Beverage star will be given for the purchased beverage when paid using the Starbucks Card. This promotion will run in all Starbucks stores nationwide. Block Street Crypto Trader Blockchain's decentralised architecture and trustless, crowdsourced approach makes it a noticeable candidate for most popular crowdfunding approach in future, however the technology as an entire remains in its infancy and as such is vulnerable to scammers and fraud, plus huge volatility within the currencies themselves. Not for the faint-hearted.